Pay Attention Say Thank You” is a delightful guide to living a happy life – full of joy, even when things aren’t going so well. Learn how to live happily, more vibrantly, more creatively and more joyfully by practicing seven techniques, some as simple as paying attention, saying thank you and being quiet. Warm and engaging, this book addresses issues of forgiveness, fear, the need for quiet reflection or meditation and for gratitude. The author provides plenty of examples and exercises. The title of this book caught my attention. I'm a girl who prides myself on living by the idea of paying attention and saying thank you. I also love self help books, so when I saw a self-help book geared at two things that I find really important in my life, I knew I had to read what other brilliant ideas the author had in store. I was not disappointed. This beautiful little book is filled with 7 different ideas to living a happier, more fulfilled life. The ideas are simply guidelines to a gentler life; rules anyone can follow, techniques anyone can live by. They aren't based on finding success in money or work or even love. They're based on merely being a better person- and the better person you are, the more beautifully you behave to the world around you, the better the things the world around you is going to offer you. This book can open up so many opportunities for you, merely by giving you the brilliant inspiration to be a better member of society. I have taken into account almost every single thing the author said. Each and every technique spoke to me. It's rare that I pick up a self-help book and think "I actually want to do Every. Single. Thing. this author is saying I should." but this book did that. Everything was so exact, so precise in the way I wanted to live my life. The author just did such a brilliant job on focusing on making this book a book that motivates people to be a better person. And I loved it. It really spoke to me and it left me feeling very inspired and more fulfilled. I can honestly say I do feel significantly happier when I follow the guidelines this book offers. Obviously I have days where I'm crabby, moody, mad, upset, nervous, or sad- that's normal. But when I make a conscious effort to follow the techniques this book offers me, and to utilize the exercises the author has offered, I feel significantly lighter. I no longer feel a burden- I just feel like a genuinely good person. I am beyond happy with this book. If I could rate it 10 stars I would, but the highest I can go is 5. Honestly, it deserves even more than that. 5.0 out of 5 starsI've Got The Joy Down In My Heart! I will be perfectly honest. I've been lacking joy in my life lately. It seems like anytime I've tried, something bad happens. I want to learn how to live a joyful life, period, no matter what the circumstances are. When this book was brought to my attention, I immediately took out my notebook and began taking notes. First and foremost, I learned that our faith is extremely important. If we give up on faith, we lose our anchor. I also learned other techniques to remaining in joy. Sometimes you need to be silent and be thankful for being alive. Yes, bad things may occur but be thankful for health. M. Gail Woodard is an amazing writer. She puts her heart and soul into this book in order to help us learn how to grow in our joy. I've learned quite a bit from this book and am planning on passing it along to my friends. If you are looking for ways to live joyfully, try this book! This book describes methods and techniques to live a happier life. Self assessments are given in the appendices to help you discover the point from which you start. This book is not a technical, peer-reviewed book, and reading many books seems to be the only credentials the author has. The techniques given are interesting and may be useful to some. The basic tenets are if you wish for something hard enough it will come true. I found the book to be flat and one dimensional. The book didn't convince me that always feeling happy and mellow leads to a meaningful life. I like the full range of emotions, even disappointment when my wish doesn't come true. 4.0 out of 5 starsPractice Until You Get It Right! Full disclosure: First, Gail Woodard, the author of Pay Attention, Say Thank You: Seven Rules & Practices for Joyful Living, is my cousin. Second, I received a Kindle copy of her book as a result of membership in the Dudley Court Press Book Reviewers Club. And third: Gail is the publisher of Dudley Court Press. 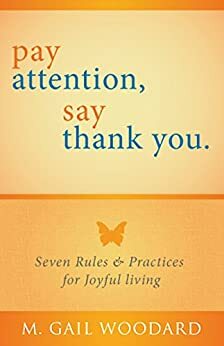 Pay Attention, Say Thank You is a guide to joyful living – the idea that each of us is responsible for how we feel and how we live our lives. Gail provides seven rules, or practices, to open our eyes to new possibilities and prepare us for profound changes in our lives. If you’re skeptical about being able to change your life by changing your thinking and daily actions, I’d advise you to skip this book. It’s not intended to convince you to change, but to offer guidance in how to experience transformational change. I like that Gail makes the distinction between rules and practices. She notes that the first three practices are indeed rules of our society: Pay Attention, Say Thank You, and Be Quiet. By couching them as practices, we’re able to incorporate them into our daily living to become more aware of our surroundings and thoughts, be in a state of gratitude, and embracing stillness and finding balance. Two other aspects of these as practices: It’s the conscious performance – the practicing – of them that allows change and growth to occur. And, my favorite, like anything new we attempt we rarely immediately master the effort. We start as beginners, and as we practice we gain proficiency, and perhaps mastery. The more advanced practices: Releasing Resistance and Fear, Heart-Centered Living, Creating Your Own Reality, and Changing the World are more complex and build on the foundations of the first three. Each practice is given its own chapter with exercises and assessments to guide us in how to use them. For as Gail mentions, unless these seven practices are used every day, they remain simply concepts, which won’t change your life.